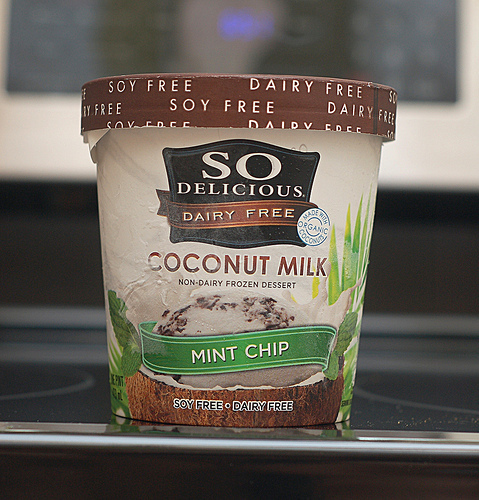 Having reviewed another So Delicious product (here) as well as another brand’s coconut milk mint chip (here), I decided to write a review for So Delicious’s Mint Chip. As with their other products in this lineup, this is a dairy-free, soy-free frozen desert which has a coconut base, sweetened by agave syrup. As you might expect from the name, this frozen dessert has a fresh, minty coconut base with a nice amount of chocolate chips dispersed throughout. The mint overpowers the subtle coconut flavor, probably because there is no whole coconut used, only coconut oil and cream. For those not accustomed to coconut-based frozen desserts, it tastes sort of like a dulled down, diet version of a normal milk-based desert. In some sense it is, because of the lower calorie and sodium content. My biggest problem is that there isn’t really anything special or unique about the flavor. It loses hands down to the same company’s German Chocolate, whose succulent caramel and pecan pieces really make for a great taste experience. 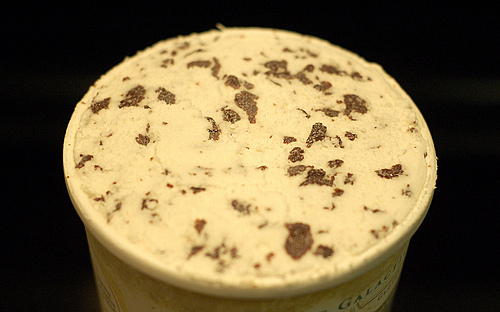 There is something strange about the Mint Chip’s texture, a lack of creaminess almost to the extent of being gummy. When I opened the sealed package the ice cream was in an odd shape with a little tornado shaped hole in the middle, almost as if it had partially melted and than refrozen. That could explain why the texture is so funky, or it could be due to the proportions of the gums that are used. 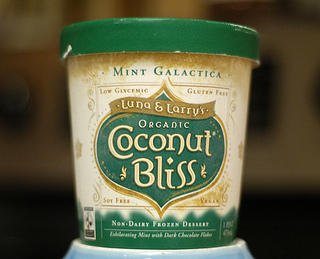 Just as with Luna & Larry’s Mint Galactica product, a balance of contrasting flavors is lacking. While this rival product does have a smoother texture, Mint Chip has the advantage of having larger sized chunks of chocolate with richer flavor. Overall I rate these two products’ flavors on the same level. Even though I didn’t love the flavor of either coconut-based mint-flavored desert, it’s not that I dislike all minty desserts. There are some milk-based ones I do enjoy such as Bryer’s Mint Chocolate Chip and Talenti’s Mediterranean Mint. Both of these have much more sugar and calories, so its not entirely fair to compare them to the coconut versions. Hopefully I’ll get an opportunity to review one of these products sometime in the near future. As is with many companies, the products in a set all have similar nutritional information and ingredient makeup. This product is no different and has much in common with the same company’s German Chocolate frozen desert. In a 85 gram serving (four total in the container) there is 170 calories, with 80 of those from fat, and both figures are lower than many milk-based deserts. Protein is low compared to most milk-based ice creams at only 1 gram per serving, although fiber is quite high at 6 grams, thanks to the chicory root extract. Sugar is only 13 grams per serving, well below average compared to most milk-based ice creams, but comparable with other company’s coconut-based products, such as Luna & Larrys. This product’s ingredients have a few key differences from the German Chocolate flavor. One is that it has significantly less ingredients thanks to the omission of caramel sauce, which contains a few undesirables like carrageenan and sodium citrite. Because of this I would say Mint Chip is arguably more healthy that German Chocolate. At first I thought the “mint flavor” listed on the label meant something which tastes like mint (either artificial or natural in origin), but doesn’t necessarily contain natural spearmint or peppermint. I checked with the company and they said this simply means “peppermint extract”, so it is the real stuff after all. I wish they would just list it an extract (as is done by Luna & Larry’s) since it sounds much better and leaves no room for doubt. I slightly prefer the ingredients of Mint Galactica to this product because the former contains entirely organic ingredients, while Mint Chip has only two (organic coconut cream and organic agave syrup). Full ingredient list: ORGANIC COCONUT MILK (WATER, ORGANIC COCONUT CREAM), ORGANIC AGAVE SYRUP, CHOCOLATE FLAKE [DRIED CANE SYRUP, COCONUT OIL, COCOA (PROCESSED WITH ALKALI), CHOCOLATE LIQUOR, VANILLA], CHICORY ROOT EXTRACT, CAROB BEAN GUM, GUAR GUM, MINT FLAVOR. 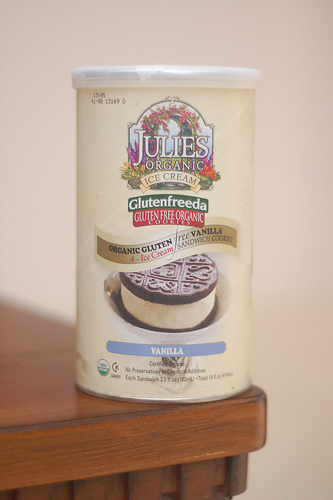 This product is certified gluten free, as per the small icon printed on the top of the carton. I bought this for $5.99 at Publix, though it is sold at many other supermarkets. This is a no-frills mint flavored coconut frozen desert with chocolate chips. It has healthy ingredients and moderate calorie/sugar levels which urges me to recommend it over most milk-based ice creams. However, So Delicious’s German Chocolate is much better tasting and has a similar nutritional profile, so you might want to consider going with that instead. I really like Whole Treat Organic Ice Cream Sandwiches (reviewed by me here), so I thought I would try out a competitor’s product to see what it had to offer. Before I even put these sandwiches into my cart I was impressed with the packaging, which has a flowery, elegant design overlaid onto a tall tube shape (think a mini version of a Pringles can). It sure beats the Whole Treat packaging which is homely, down-to-earth, and just looks cheap. Some of this may have been intentional on their part, though. This sandwich is made from two discs of chocolate, as opposed to the Whole Treat one which is made of two rectangular-sized ones. Julie’s also makes a rectangular one according to their website, but I don’t remember seeing that in the store. When comparing these two sandwiches, Julie’s sandwich does everything bigger and thicker than its Whole Treat rival. For example, the total weight is roughly 20% more, and the ice cream in the middle is significantly thicker. The cookies have a similar texture to Oreos, but somehow seem to crumble in my mouth before I’m expecting them to, leaving behind an almost grainy sensation. I prefer the Whole Treat sandwiches texture which is is bit softer and moister, and allows your teeth to really sink in. The cookie itself also has a very pronounced sweetness backed by a milder saltiness. When I got to the ice cream within, I felt the thickness was a bit extreme. I’d even go as far as saying it made it difficult for me to fully appreciate the flavor. I either could force myself to bite off the full berth of the sandwich, which was more than I was comfortable with, or nibble away at it with multiple bites which was similarly awkward. On the other hand, the competitor’s thickness seemed just right and allowed me to eat it naturally without even thinking about it. The ice cream flavor itself has a nice robust milk flavor to it, but again I felt it was a bit on the sweet side and too thick with cream. This is without a doubt a delicious desert, but judging from taste alone I prefer Whole Treat’s product by a wide margin. One sandwich weighs 74 grams and contains 200 calories, 90 of them from fat. There are 18 grams of sugars, 3% DV of sodium, and 3 grams of protein. These figures are all very close to the Whole Treat sandwiches when adjusted for serving size, an interesting fact because my overall impression of Julie’s sandwich was that it was sweeter and higher in calories. This is likely because of the 20% difference in overall size, as well as the width of the sandwich. Though there are many similarities and both have generally natural ingredients, I prefer those in Julie’s sandwiches for a few reasons. First of all, in addition to being organic the cookies are gluten free, through the use of rice flour instead of normal wheat flour. According to Wikipedia, about 1 in 133 people in developed nations have an allergic reaction to gluten, which can be very serious. Because of this, this product is available to be eaten by a larger audience which is always a good thing. I’ve even heard stories of people who have minor gluten allergies that don’t realize it until later in life, so you might want to try experimenting with gluten free foods and see if you body reacts better to them. Second, there is no caramel coloring. It’s true that Whole Treat’s coloring is in class I, the least risky of the four classes, but no coloring is always better in my book. There is also a few natural starches used, tapioca starch, corn starch, and potato starch, which may add a little more vitamins and minerals. Finally, cocoa is listed much higher, at 5th place compared to 11th place for Whole Treat, and therefore likely to be in much higher concentration. This gives the consumer a better chance of reaping cocoa’s many potential health benefits. I think some of the black color comes from this, and possibly some from the starches used. Organic Vanilla Ice Cream – Organic milk, and cream, organic cane sugar, organic tapioca syrup, organic vanilla extract, organic tapioca starch, non-gmo soy lecithin, guar gum, locust bean gum, xantham gum. Gluten Free Chocolate Cookie – Organic rice flour, organic unsalted butter, organic cane sugar, organic eggs, organic cocoa, organic corn starch, organic potato starch, baking soda, organic vanilla, sea salt. I purchased this at Whole Foods for about $6.99 and haven’t seen it anywhere else locally. However their web site search tool says there are a few other places nearby, such as Vitamin Hut and Simply Natural, which carry their products. Considering Whole Treat’s product gives you more total product (6 x 60 = 360 grams vs. 4 x 74 = 296 grams), the price is a bit expensive. To be fair, Whole Foods can save money distributing its own products so some amount of price difference is not unexpected. These are large ice cream sandwiches that taste great and are composed of organic, gluten-free, and natural ingredients. Though I would rate it’s ingredients slightly lower overall, I prefer the taste of Whole Treat’s competing ice cream sandwiches for their light, easy-to-eat experience. This is my second product report of a Luna & Larry’s Coconut Bliss product, the first being of Chocolate Walnut Brownie flavor. I’m a big fan of that ice cream so I thought I would experiment with another flavor. I’ve had my share of mint ice creams: Bryer’s mint chocolate chip was one of my favorites as a boy, and recently I’ve enjoyed Talenti’s Mediterranean Mint on a handful of occasions. I was won over by this product’s great name (could it be because I’m a fan of Science Fiction? ), even before I tossed the pint into my shopping cart. If I gave a rating for naming, I would surely give this a 10/10. The base cream has a strong coconut flavor, more so than other makers’ coconut ice cream I’ve tasted, and the mint is very much in-your-face. These two flavors mesh well and make a great foundation for an excellent taste experience. But this ice cream falls short to deliver a strong counterpoint which serves as a contrast, like a picture with a well defined foreground and background. In my previous review, there was a nice contrast between the sweet chocolate coating and the (somewhat) crunchy cookie part. The chocolate flakes are supposed to serve that role, but until I ate this I didn’t realize the true difference between ‘flakes’ and ‘chips’. Chips are cube shaped and flakes are, well, similar to well-known corn flakes where they have a large, irregular surface area, but are extremely thin. My problem with this shape is that they appear large and tasty, but when you taste them there is practically no substance. As a result they don’t influence texture or taste much. I included a close-up picture of the flakes at the bottom of this post for reference. After several servings of this I might get used to these flakes and understand their contribution better, but at present I just feel like there this product is just too hollow and lacking depth. Another minor disappointment is that this ice cream is white, not colored green like some other mint-flavored creams. Of course I’m against using artificial colorings, but apart from that I feel the color has a psychological effect of emphasizing the mint flavor and making it taste all the more refreshing. To me, plain white signifies vanilla, which is at odds with the actual flavor here. Don’t get me wrong – I’m not trying to say this coconut ice cream is that bad, its just that when compared to similar products it falls short. In fact, I am enjoying eating it while writing this report. A 1/2 cup serving (97 grams) contains 15 grams of sugar, below average for ice creams, and 240 calories which also on the low side. There are 3 grams of fiber and 2 of protein. Nutritionally this ice cream is very similar to the previously reviewed Chocolate Walnut Brownie, except that here we have much less Iron (4% vs 15% DV), one-fifth the salt (10mg vs 55mg), and a few other minor differences. The base ingredients are also similar between these two products, and everything is organic. Of course there are no brownies or walnuts, which have been replaced by peppermint extract and coconut cream, the latter being an ingredient I haven’t seen used before. The chocolate here is in flake form as opposed to be mixed into the cream itself. I have been researching the health effects on various types of sugar, and apparently some professionals believe that agave isn’t especially good for the body. The high amount of fructose contained in agave makes it resemble the dreaded “high-fructose corn syrup”. I plan on doing some more research on this critical topic and eventually would like to write a detailed post with my results, but for now I’ll just say that there is disagreement on how healthy each type of sugar really is. I personally still prefer agave to standard sugar, but because of the uncertainty I’ve reduced my ingredients/nutrition rating of this product from 8.5 to 8.0. This typically sells for around $6.49 with tax. This a bit pricey for those on a budget, but not unexpected, considering this is a non-dairy specialty product. There a only a few places that I know of in South Florida that sell this, one is Whole Foods Market which is where it happened to be on sale for roughly one dollar cheaper. Nice healthy ice cream with natural ingredients, but the flavor may be a little underwhelming for those who are used to other mint creams. There is almost no sweets from my college days that I still enjoy now in my 30s. Our subject this time, a sugary chilled drink, is one of the few that has passed the test of time and taste. It’s also very high on my list of guilty, unhealthy pleasures to quit. In that way I have a true love/hate relationship with this drink. For those easily-addicted types with a sweet tooth, I highly recommend stopping here and moving on to my next report. It will save you innumerable calories and pounds. Chocolate chips, coffee, and milk, blended smoothly with ice, topped off with a very generous spray of whip cream, further layered with a criss cross of chocolate syrup. This is a good objective summary of the basic ingredients and flavor of this decadent dessert-lovers dessert. Being a long time Java Chip junkie, I perceive things more as succession of sensations and stimuli. First, the welcome chill as near-freezing liquid passes through a wide straw, into my mouth, through my esophagus into into my stomach. In passing, the sugar gives my taste buds a jolt and I start to feel the high coming on. Not long after the caffeine kicks in, sending me to a state of near-enlightenment – a true altered state of consciousness (*). Occasionally I use my straw as a spoon, scooping up swaths of fluffy whipped cream for a mild dairy intermission, or snipe up gobs of rich dark syrup for a burst of extra sweetness. Alas, things aren’t always this blissful. A combination of badly trained employees and differing recipes makes this drink more like a roulette wheel of chance. The amount of caffeine, chocolate, ice, and mostly importantly how well blended the beverage is, varies considerably even within a single store. Around 20% of time it’s a perfect ten, and in rare cases the drink will get totally botched. This reminds me of the time I glanced at the cafe counter and caught sight of a snowy white drink which had just been placed there. A moment later the barista said my Java Chip was ready. My eyes blinked in disbelief. When I asked the barista if he put coffee the drink, his returned answer put me in a state of shock. “There is no coffee in Java Chip Frappuccino”. 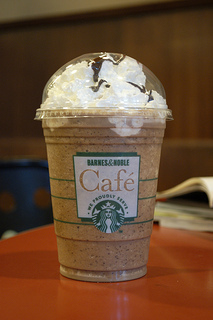 A “grande” (medium) size is 16 ounces and, with whipped cream added, has the following key nutrition facts: 460 calories, 66 grams of sugar, and 110 mg of caffeine. The calorie count is comparable to two servings of ice cream, if not less, but the sugar concentration is a bit extreme. The caffeine is roughly equivalent to two shots of espresso. Sometimes the problem nutritionally with foods is not with what they do contain, but rather than what they lack. It’s true that chocolate, coffee, and milk all have benefits according to nutritionists, but there isn’t much here to supply the body with needed vitamins and minerals. My gut confirms this when I down these 16 sugary ounces on an empty stomach. Hunger is suppressed for a short time but then renews with even greater vigor, leaving me starving with a stomach full of junk my body doesn’t need. Sugar and caffeine are both strong stimulants in the right dose, and while this drink is good for a quick pick-me-up, I can’t help but feel that frequent usage has the chance for adverse long-term effects. Another problem with this drink is that the full ingredient list isn’t published, which means there is bound to be all sorts of scary things like artificial flavor in the syrup used. Which is why I do plan to kick the Java Chip habit. Eventually. The “grande” size goes for $4.25, which isn’t too bad for a dessert of this type. Those of you watching calories can go for the “tall” 12 ounce size, but with a price of only 50 cents less its a hard sell. There is also a “light” version for the same price with roughly half the number of calories, but I haven’t tried it. These are available at Starbucks Cafe, or at Barnes & Noble Bookstores Cafe. I tend to use the latter, which may be why I have had such an inconsistent experience. A serious drink loaded with enough sugar and caffeine to keep you up for hours. Not recommended for anyone too concerned about nutrition. (*) This sort of sensation is a good (though slightly exaggerated) account of what I felt when drinking this product until recently. Since I started drinking coffee on a daily basis several weeks ago, my caffeine tolerance has increased so my body responds less readily to the stimulation.